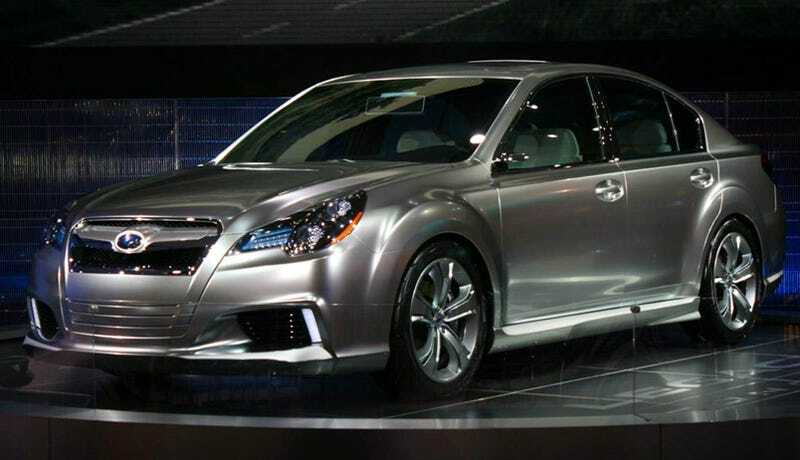 These first live images from the Detroit Auto Show of the Subaru Legacy Concept show a car meant to telegraph the design direction on the next version of Subaru's family sedan. The press event for the Subaru Legacy Concept isn't till later today, but the car is sitting out for all to see. The aggressive look walks away from the Legacy's current sleeper status and the crazy-shiny paint job doesn't help dissuade that. Inside it looks like the Legacy Concept is loaded up with tech with integrated head rest monitors and a huge all-LCD wide screen rear view monitor instead of a mirror. Tech for tech's sake, if you ask us. Stay here for the complete details later in the day.